Avocados are an extraordinary fruit. Highly caloric – an average-sized Hass avocado runs about 250 calories, 80% of which are from fat – but also chock-full of vitamins, minerals, and fiber, and the fat is mostly unsaturated. I love avocados, but I’d never made them a regular part of my diet: The only way I prepare them is as guacamole, for Mexican-style meals. With guacamole vaguely in mind, I picked up a big avocado recently. It sat in my fruit bowl for several days until it fully ripened, and when it was ready I realized I actually wasn’t in the mood for anything Mexican. It was time to try something else with the avocado, and I soon decided what it was to be. In my big recipe binder was an item I’d cut out of a magazine years earlier – a recipe for Floyd Cardoz’s Goan Avocado Salad. Cardoz was then the owner-chef of Tabla, one of the early restaurants in the Danny Meyer group. Probably thousands of people, including myself, still regret the loss of Tabla and its Bread Bar, which introduced New York to a style of Indian cooking that it had never seen before. The aromas that met you when you entered Tabla were a revelation in themselves. One of the best loved dishes there was this avocado salad. The recipe’s preparation is very easy. 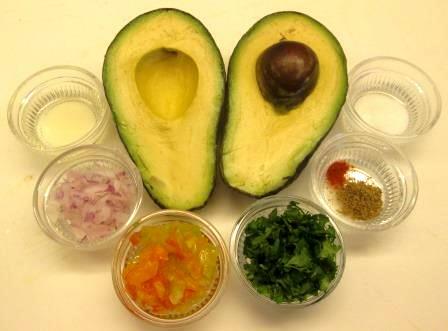 The avocado, cut in half-inch pieces, is dressed – from left to right in the photo below – with olive oil, onion, tomato, cilantro, cumin, cayenne, and sugar. 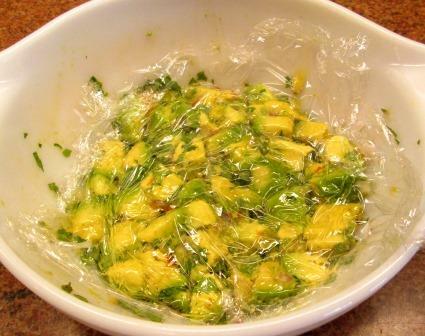 You gently mix everything together in a bowl, press a piece of plastic wrap directly onto the surface to keep the avocado from discoloring, and put the bowl in the refrigerator for two to three hours. The recipe calls for serving the salad with chips made from naan, the Indian flatbread. I substituted the pitas I had on hand, cut into triangles and toasted lightly, which could be used either to scoop up the salad or to nibble on the side. The salad was excellent. After all this time I can’t recall if it resembled the version served at Tabla, but it was fine in its own right. Though it shares many ingredients with guacamole – avocado, onion, tomato, cilantro – the proportions are different, and the cumin and cayenne spicing, rather than fresh hot chile, give it a whole different character. 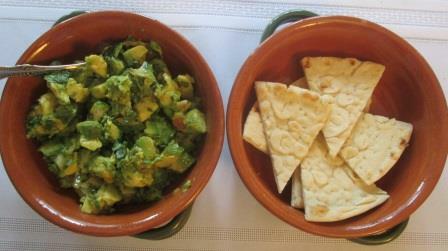 Also, since the avocado is chunked rather than mashed, the mouthfeel of the dish is quite different from guacamole. It’s pleasant to eat with a fork or spoon, not just as a dip for chips. The toasted pita, by the way, went perfectly well with it.